This past February, I was browsing one of my favorite Digital Media Blogs, ZatzNotFunny! and reading an article about making the TiVo tweet. That article got me thinking and I posted a request for a similar twitter app for the HTPC software I use at my home, SageTV. I'm not sure if Derek ever saw that post or was just inspired to create this app on his own, but either way I'm really happy with the result. SageTV now has its own cool Twitter app that enables your SageTV devices to "tweet" their status on Twitter. 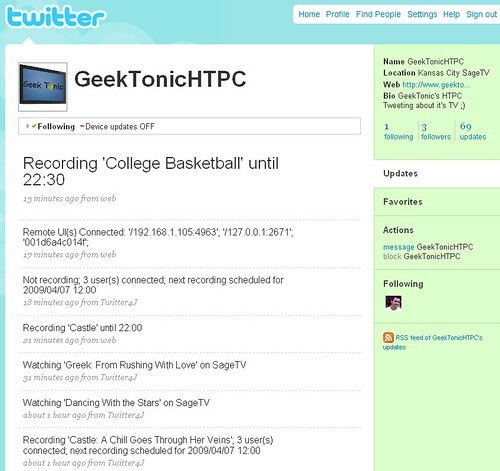 Currently you SageTweet allows you to connect your SageTV server to twitter and report what is recording, when to expect your next scheduled recording and alerts you to when your server is running out of disk space. This version is an early beta version with future enhancements planned including lots of UI polish as well as the ability to tweet additional alerts such as recording conflicts etc. You can also connect any of your extenders (SageTV Client PC's Included) which can tweet what shows are being watched. I gave Adam over at Entertainment 2.0 a little "trouble" over his Windows 7 Media Center tweets (similar twitter functionality using Media Center Health Monitor) because of some daytime programming (my HTPC tends to record those silly soap operas also by the way thanks to the wife) so I can understand how some might not want to share every little detail about their HTPC's behaviors. If this is a concern, you could "protect" your HTPC's twitter account so that only you could see it. I'll keep mine exposed for now to continue the testing - so far it's only been some spammier accounts following it so I doubt it will be an issue anyway. Open up a web browser and navigate to http://SERVERNAME:8080/sagetweet/ (Replace SERVERNAME with your servers IP address or servername.) Also note that the port (I used 8080) should match the port you set for Jetty in step 3. In the current beta version, you can set your server to tweet (or not to tweet) and tell it when and what to tweet. This page is where you tell it which clients you want tweeting by putting in the client ID (you'll find these in the SageTV\SageTV\Clients\ directory) and tell it which twitter account to tweet. Hypothetically, each server and individual SageTV client could have its own twitter accounts. I set all of mine to go to the same Twitter account. This 3rd Party SageTV application was developed by Derek Battams and uses Twitter4J (is a Java Library for the Twitter API) and Jetty to make things work. Derek is the mastermind behind a few other SageTV apps that I've been eyeing for a while and hope to report on more in future articles. This app is highly recommended for SageTV users. It's pretty easy to set up and if you're a twitter user, quite useful as well. For more SageTV information on GeekTonic, be sure and check out the GeekTonic Ultimate Guide to SageTV with lots of links, reviews, 3rd party app write-ups and more.